Ramdung Go lies in the upper Rolwalling region south of Na. 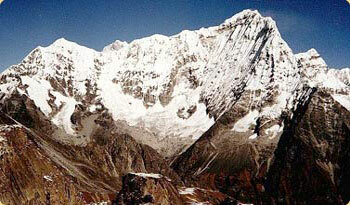 It is an excellent peak that surrounds the Yalung La. The peak was first climbed in 1952 by a team led by Bill Murray. The normal route for climbing this peak is through the glaciers of the North East face and the route is pretty straightforward. Tso Rolpa Ice Lake, Beding village (Homeland of the mountaineers), magnificent views of Gaurishanker range and Everest ranges plus many glaciers. Day 23 : Transfer to airport for departure to your onward destination.